If you’ve read our recent blogs about our travels in Italy, you’ll have worked out that here at CW we have a love, maybe even a lust, for hotels that have that magical ability to provide the best service, stunning design, the most memorable food and the 5 star comfort we expect without being ostentatious. These are the hotels around the world that we hand pick to work with for a destination wedding. We actively search out these hotels around the world because it not only fundamentally resonates with our brand, it completely echoes our ethos. Understated luxury. Pure and simple. So without any further ado ladies and gents, I give you The Betsy Southbeach, Miami. We were recently fortunate enough to spend some (highly enjoyable) time with the lovely Nicole Lopez, Events Manager at the Betsy. We are often invited to meet representatives from a lot of hotels, but sometimes from the first couple of minutes it’s clear that this is a match made in heaven, and this was one of those rare moments. There was so much common ground between our styles that we could have been sister companies! Looks so much like a CW wedding! So, let’s stop the love in and give you some background and details on this gorgeous hotel, and how it would work for your destination wedding. 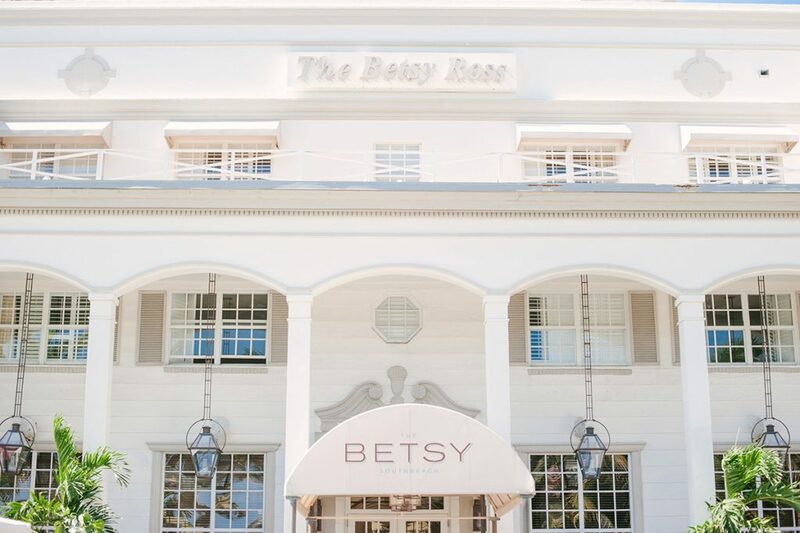 The Betsy truly is a landmark hotel in Miami, providing an elegant, personalised boutique experience in the heart of South Beach. There are 130 welcoming rooms and suites that create an atmosphere that is exclusive yet low key. Built in 1942 by L. Murray Dixon, the architect responsible for many famous Miami Beach Art Deco hotels, The Betsy stands as the lone surviving example of Florida Georgian architecture on Ocean Drive today. 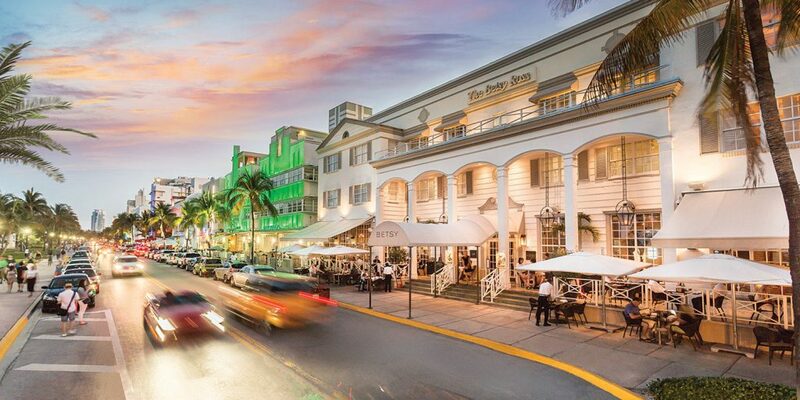 Extended in 2009 The “new” Betsy-South Beach is made up of the existing Ocean Drive arrival building – the Colonial Wing, and the fully renovated, Carlton Hotel – the Art Deco Wing. So you can stay in the Georgian Colonial Style wing, but still get your fix of that iconic Miami Art Deco style! The spaces for a wedding here are simply stunning, and can cater for the intimate to the extravagant. 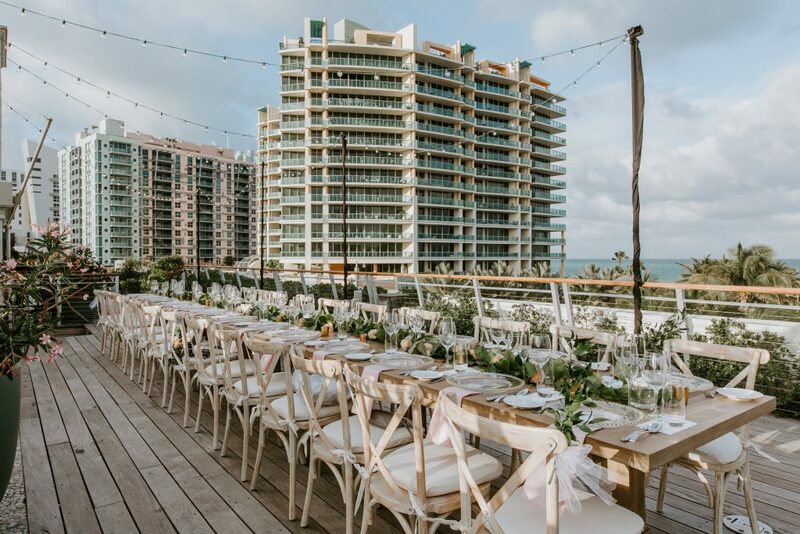 If you’re a UK couple heading to Miami for your destination wedding, the chances are you’re going to want an outdoor event right? Choose from the three (yep, three) stunning terraces. The Ocean Front Deck is Intimate and unforgettable, mixing breath taking views of the Atlantic Ocean with a refined and romantic atmosphere. 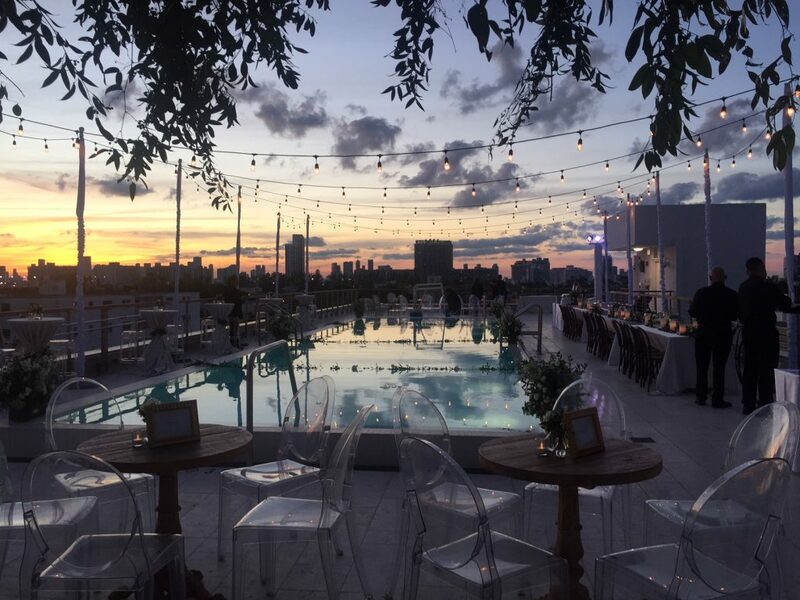 The Skyline Deck is at the highest point of the Art Deco Wing, and offers 360-degree views of the Miami skyline and Atlantic Ocean. Or go for the Rooftop Pool Deck and soak up the views of the Art Deco District. However, the spaces inside are equally impressive (and not only for us as wedding planners who absolutely love a Plan B)! 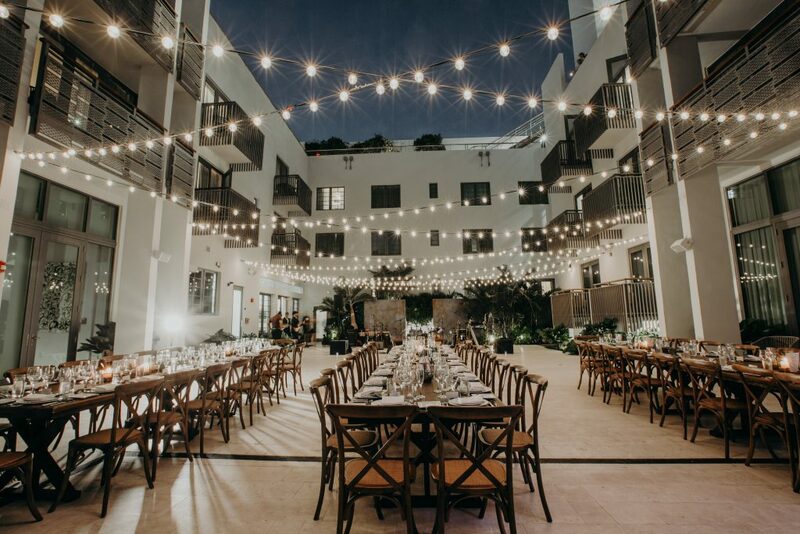 The Lobby can hold receptions up to 125 guests and LT Steak & Seafood is an exquisite space for entertaining, with timeless style and a flexible set up, meaning if hired exclusively 120 guests can be seated. 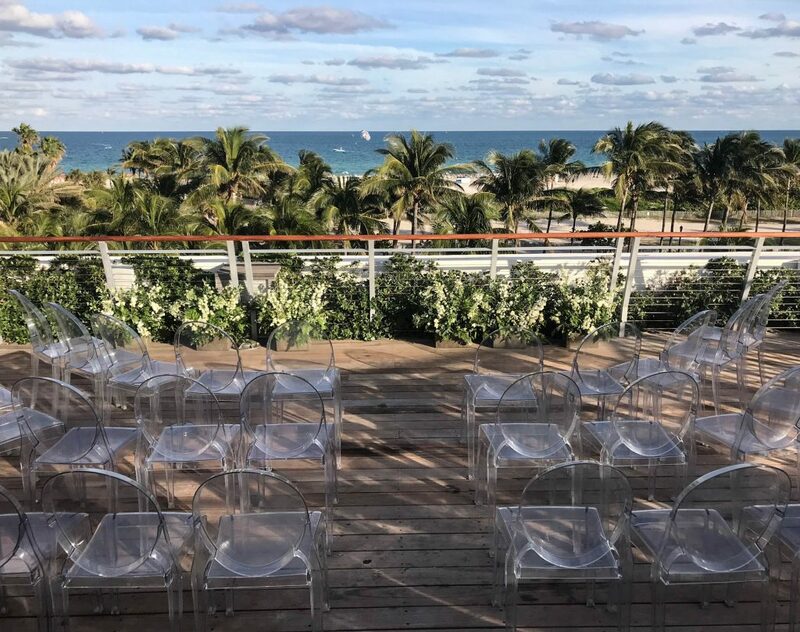 The Atrium is the largest space, where South Florida style meets a touch of European elegance, and can cater for receptions for up to 300 guests and dining for up to 200 guests. There are many more spaces, the Gallery, the library, (which can also be used as the most stylish Groom’s Dressing Room ever! ), the Carlton Room, The Alley and The Boardroom, but we just have to mention our two favourites! First off, the B Bar is stylish and sophisticated. 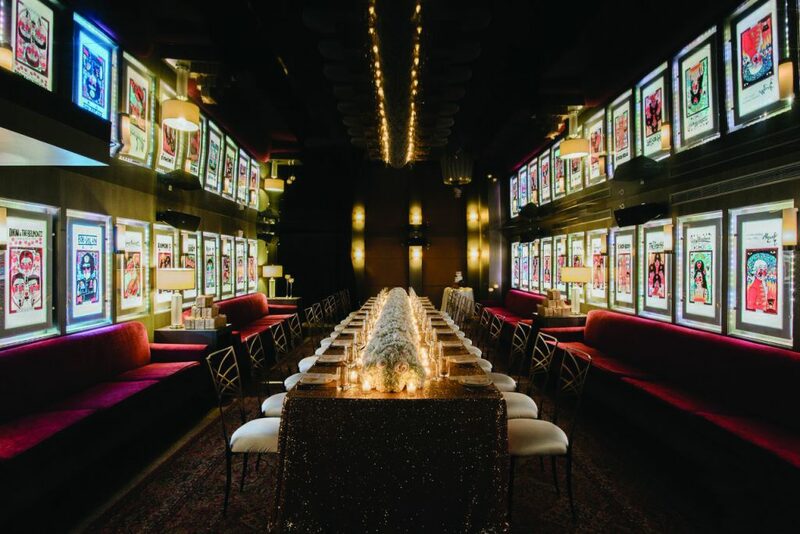 It has a speakeasy vibe to it, just keeping that sultry edge, whilst still maintaining its glamour. 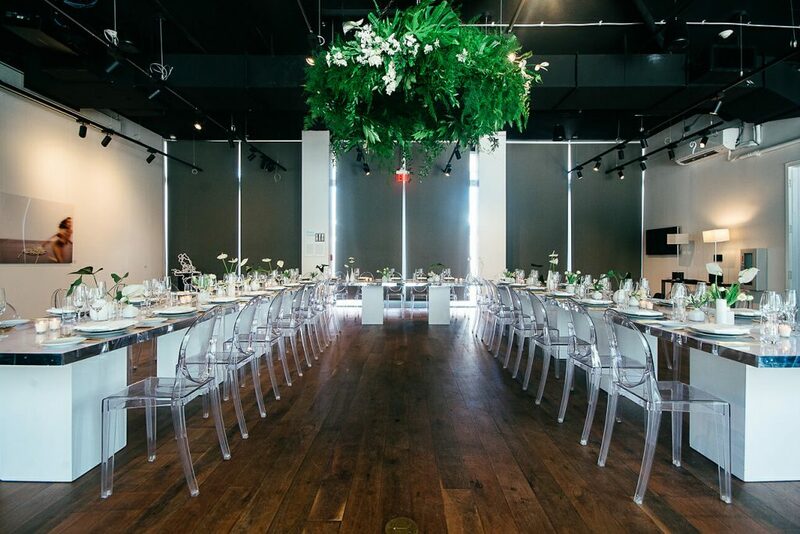 Artwork graces every wall, the atmosphere is intimate and we feel it is absolutely perfect for a CW couple’s rehearsal dinner – seating up to 60. 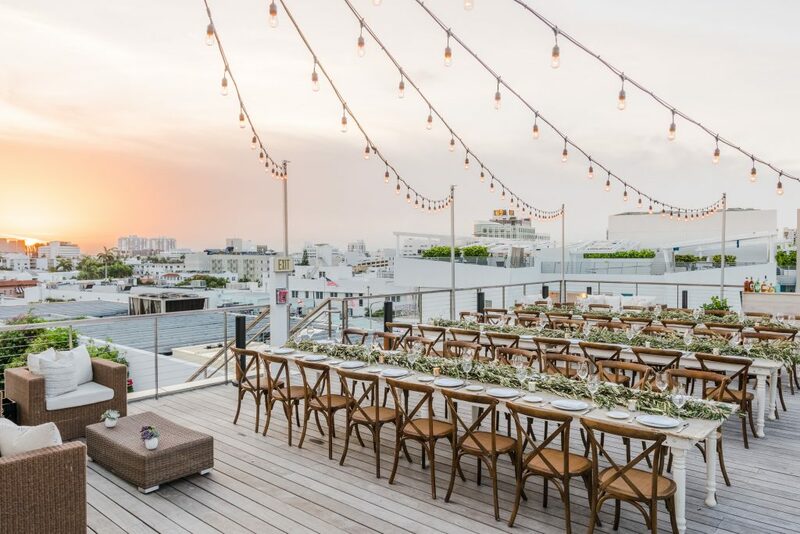 Lastly then, there’s the Skyline Penthouse & Terrace – this space is perfect for a super exclusive reception for up to 50 guests or dining for up to 30 guests. The loft-style penthouse is 905 square feet of high spec and luxurious entertainment space. Coming complete with its own baby grand piano, spacious wrap-around terrace and a private elevator (just so you can feel even more exclusive)! It’s a seriously desirable space, in a seriously stunning hotel, in a seriously cool city! The fact of the matter is The Betsy combines impeccable design, bags of history, understated elegance and modern styling to create an atmosphere that is perfectly suited to a CW destination wedding couple. The spaces are so varied, meaning any style can be incorporated and designed to enhance the stunning look and feel of the hotel itself. Full on luxury or minimalist chic. Colour blast or pure white simplicity – it all works here! 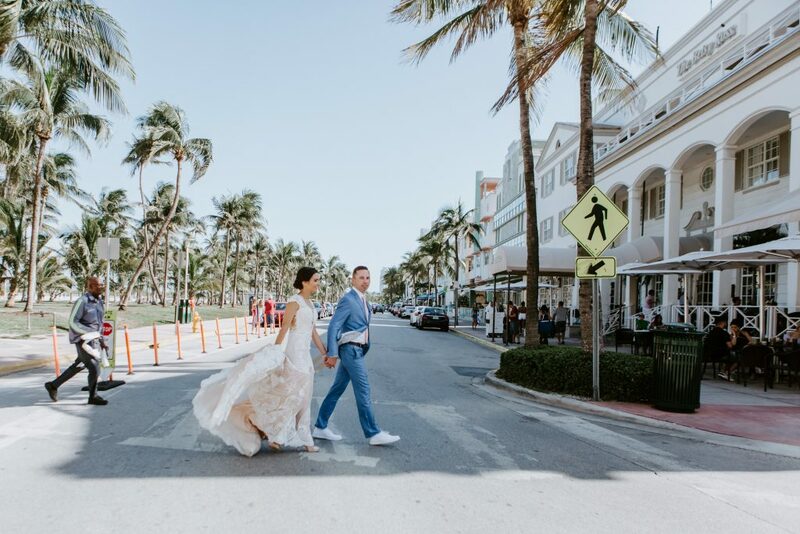 So, we could go on, but hopefully this gives you a taster of what The Betsy can offer you for your destination wedding in Miami. As their approved UK Wedding Planner, we can’t wait to work in partnership with them and our UK couples to create truly spectacular weddings in this iconic venue.